It was supposed to be 20 degrees today here in Maryland, but when we went out to walk with Alex it felt more like -5. If you are planning to walk your dog in cold weather, please make sure you bundle her up, you too of course, and make the walk a little shorter than usual. As the picture clearly shows, Alex was not very happy with our walk, but on my defense I’d like to say that we took a shorter walk than usual. Talk about an ungrateful canine child. To my amazement, Alex actually posed for this picture. But I was thinking that it was because she was so cold that she did not want to move at all. I took all these pictures as soon as we got back home. Wow! A total of 4 pictures and I did not have to chase after her for that. 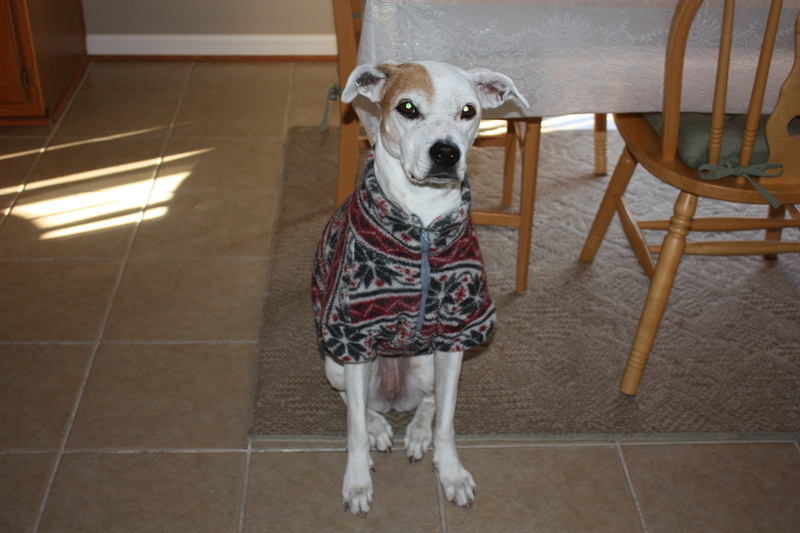 Do take your dog for a walk, but please remember that they also need a sweater or jacket in this unforgiving cold weather. My suggestion for both human and canine alike would be the following: bundle up, walk fast, ok., walk really fast, shorter walks, hydrate after the walk and turn up that heater full blast once you get home. Enjoy your walks. 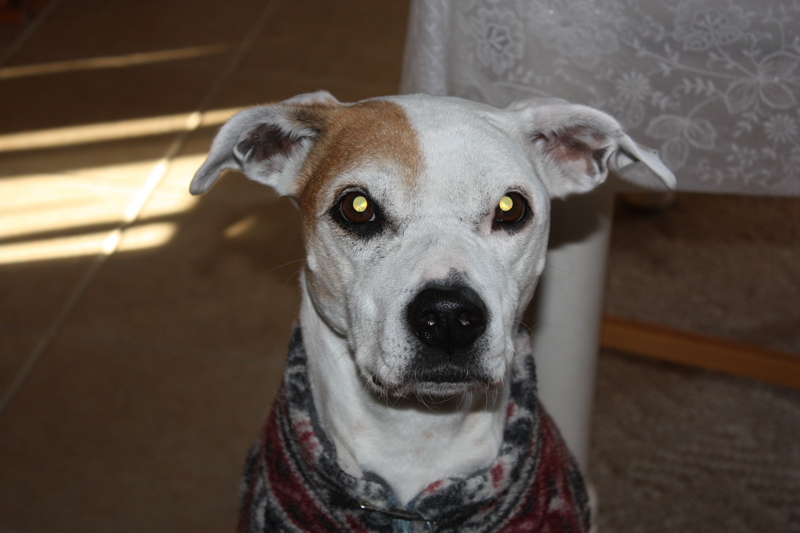 This entry was posted in Dog Equipment, Dogs, Humor, Nutrition, Outings, Walking and tagged Breeds, Dog, Pet. Bookmark the permalink. Marcela, I have a question about dog walking. I was walking my two dogs yesterday and a dog attacked us. It was from a house nearby where the owner didn’t have a fence or a leash on the dog. How do you deal with that on your walks? Do you have a way to deal with it? We live in the country and it’s wonderful to walk our dogs but I have to admit, I dread seeing another dog fight. Hi Taylor. I am sorry about your encounter with another dog. That has happened to me a few times, and this is what I did: I stopped walking because my dog, a pitbull mix, stopped and sat down. Alex, my dog, looked away and as such told the other dog that she did not mean any harm. Another time, a big dog charged at her and she did the same thing, she sat and looked away. The more calm and unengaging your dog is the better the results. As for the pet parent, if you are going to scream, scream a few times for help, but don’t over do it because screaming only excites all dogs. I now carry a spray, like the one used on humans, because I moved to MA and I have had a few bad encounters. Have I used it? Yes. I do suggest to pet parents to buy one. Because there are so many irresponsible people, I don’t go out the door with out it. I hope this helps. Thank you so much, Marcella. Your input is really helpful. I’m going to take my doggies to the vet to get them all checked out and I’m buying one for our walks. Thanks again! 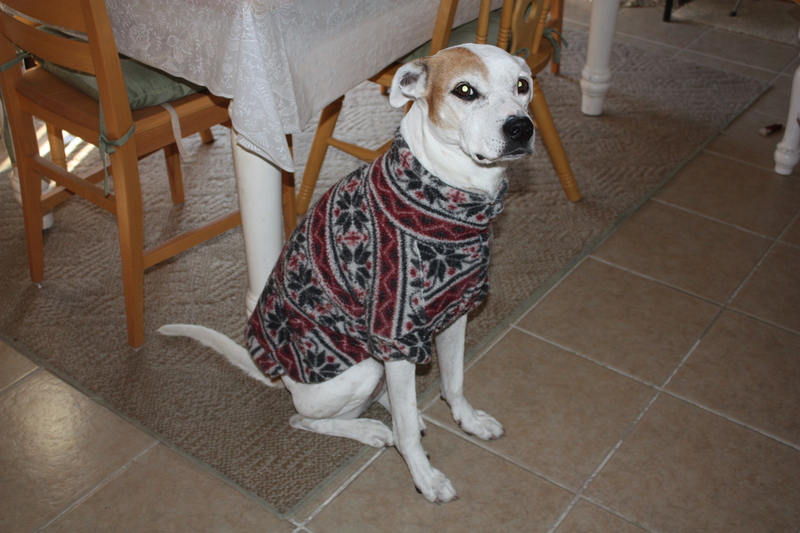 Adorable – dog and sweater. That doesn’t look like fleece, is it? I wish I could have a short and fast walk but mine has to sniff every pee card left by every animal in the neighborhood. Thankfully our cold (California) is nothing compared to yours. Barney holds out and won’t do his business unless I take him for his walk. Otherwise I’m afraid we would set the alarm a little later and sleep in. Sabbath does her business promptly upon waking and almost never on a leash, but will NOT be left behind for the walk! Short and fast! That’s our strategy! That face is priceless! Brutally cold here in Chicago as well. 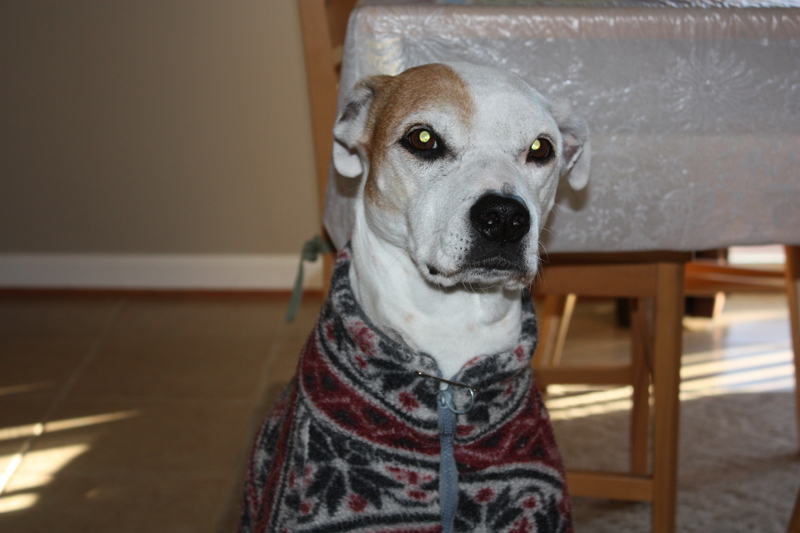 I usually throw on Eko’s jacket and take him for a fast jog to keep us both warm. Morning and evening walks are quick and short, just like yours. She’s posing alright, she wants a record of that “hairy eyeball” she’s giving you! Great pictures! so cute! reminds me of my pup after her cold or rainy weather short walks! thanks for reminding everyone to bundle up their pouches!